As part of the Love your Blog Challenge by A Playful Day I shared with you recently that I have created a new little section around the theme of a handmade wardrobe (you can find a link on the main menu). The idea is that every time I post something relating to this theme you will be able to find it in the new section. But what is this theme all about? It is quite simple really, I have become very interested in creating beautiful items for my wardrobe that are made with my own two hands, so I decided to use the blog as a tool to stay inspired and keep track of what I am doing to achieve this. Why a handmade wardrobe? This is of course not a new concept and many of us who crochet, knit or sew are actually working towards this without a proper label for it. I first heard someone mention it as such while listening to an episode of Woolful featuring Karen from Fringe Association. At the time I was just starting to dive in to the challenge of crochet garments so this idea really spoke to me and started to circle in my head with no plans to leave any time soon. It made me think about what finished projects I actually wear which led to the stunning realisation that I was wearing hardly any. Even my designs were in a drawer somewhere gathering dust. While doing a sample for a design a few months ago for a pair of fingerless mitts I suddenly stopped. Why am I doing another pair of these when I don’t even like fingerless mitts! It has never made sense to me to leave the fingers uncovered, along with sleeveless jackets they are a mystery to me. 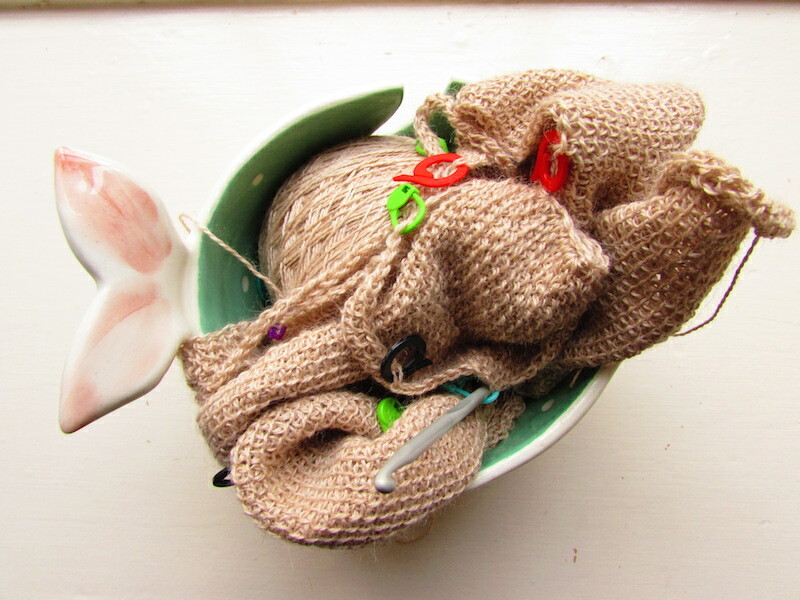 But here I was making another pair to go on the drawer with the first pair and the wrist warmers I don’t wear either. What is the point of investing all these time and effort on something that I will never wear? Over the years I have made hats that are too loose or too tight, scarfs and wraps I don’t like the colour of, sweaters that don’t fit and the list goes on and on. The point of a handmade wardrobe for me is to create pieces that you will not only love to make but also love to wear. 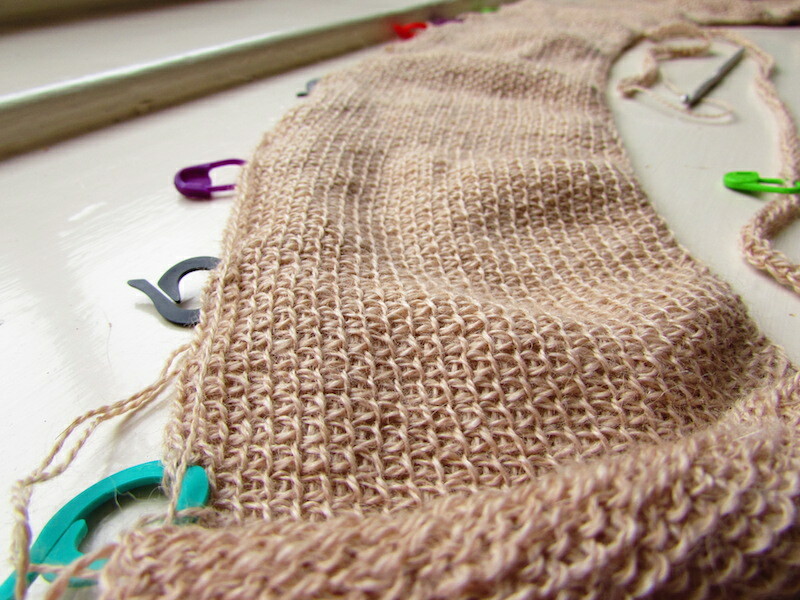 And for that you need to use the right yarn, the right colour and make the right size. Karen talks in the podcast about “making with intention” and that is the key to achieve this: you really need to think about what you need in your wardrobe in the context of everything else in it, what colour it has to be, what outfits you can create with it, and of course make sure that the fit is just right. Currently I have two shawls and two cowls which were made with a bit of more thought into colours and wearability and I am happy to say that I do wear them and most importantly, I love to wear them. My WIPs consist at the moment of one shawl, one cardigan and one cowl, and I also think they will all be a happy addition to my wardrobe once finished. The colours go well with what I usually wear, they are practical, stylish and I have put a lot of effort to make sure everything fits just right. Another reason to embark in this new journey relates to the environmental impact of the clothing industry and my wish to buy less industrially manufactured clothes. This is quite a big thing for me since I have always been a bit of a shopaholic and even though since moving to the UK I have been a lot better I still buy clothes many times just because I am in the mood of buying clothes and not because I really need them. There is a lot of info out there so I´ll probably dedicate another post to this and how we can be a bit more sustainable when buying clothes and making our own. This space will continue to be all about my crochet journey, this is just a new light to that same journey that will help support it, shape it and give it purpose. I am back today with my post for the next prompt for the Love your Blog Challenge organised by A Playful Day (if you missed the first prompt you can check my last post here). If you are a blogger I would really encourage you to check out the posts that Kate has developed to support the challenge, they feature some amazing bloggers and really great tips to help keep your blogging mojo. First of all I want to thank everyone who left a comment on my last post about interactions and community, it was really nice to get your feedback and views on this topic and I really appreciate the encouragement you have given me as well. It has been so fun to read other people’s posts and I am very happy to be contributing to our awesome community. This week it is all about beginnings. And unlike last week’s post which was a bit of a struggle to get done, I couldn’t wait to get started with this one after such encouragement. I decided to give my blog a bit of a new leaf to honour this theme, with a new look, a new domain and also a new section. You can now find my blog at acrochetjourney.com, any of the links to the wordpress.com site will still work with this new domain. If you look at the menu on the top you will see my usual pages for tutorials and free patterns, but you will now also see a new one under the name “handmade wardrobe”. 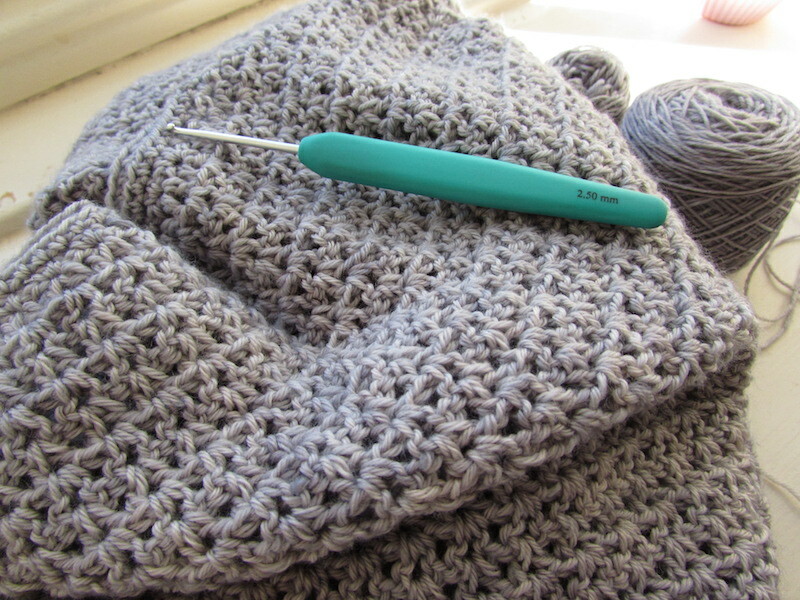 I realised while thinking about beginnings that I really wanted to start exploring this theme more, first with crochet but eventually with other crafts such as sewing and knitting. After realising that I was spending hours and hours working on projects that I never used I have been putting a lot more thought and attention to each of my projects to make sure that it will be something that I will love to wear once finished. One thing this challenge has made me realise is that I really want to inspire people to give crochet a try and wouldn’t it be great if I could inspire some of my readers so that we are all making lovely garments or accessories that we not only love to make, but also love to wear. 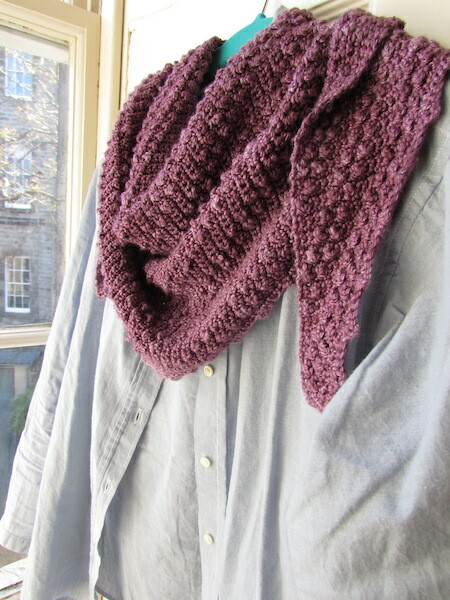 There is something so special about handmade items, and clothes really strike a cord with my practical self. You always have to wear clothes don’t you? Well… not always but now we are getting off track! The new section will contain all my posts from here onwards which relate to creating your own wardrobe pieces, from inspiration and patterns that I would love to try to WIPs and FOs that are being added to my wardrobe. I will do an introductory post soon and start creating content for this new section. Of course this is still a crochet blog so it will centre on crocheted items but with a bit of inspiration from other crafts as well.